Tuesday Tip: Avoiding Typos and Getting Grammar Right! Typos happen. Everyone makes them, but if you’re not careful, you can end up on blogs, as the topic of office chitchat, or even in the news. (See here for how Adweek spelled “Zynga” as “Zenga” on the front page of its re-launch issue, causing a small backlash.) It’s human to overlook something that you’ve been staring at for hours, but with a preponderance of pundits out to scrutinize, you must do your due diligence. 1. Sound it out – After working on a draft for awhile, it all meshes together and you aren’t really seeing it anymore. Reading out loud allows you to catch anything that sounds amiss and make corrections. 2. Four eyes are better than two – Regardless of how many times you’ve checked your work, there’s no substitute for a fresh pair of eyes. Typos and grammatical errors will pop out, and a fresh read can also help you curb verbosity and improve the flow of your document. If there’s time and the resources, have two other people look it over. Sloppy word usage and punctuation give the impression that you’re either uneducated or that you don’t care. Though some would say any publicity is good publicity, you don’t want to end up here! 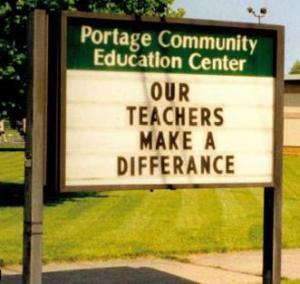 The Best Spelling Mistakes on Education Related Signs. So, (perfectly acceptable) help rid the world of lousy writing by improving yours a little every day.